Is that you Dr. Delaware? 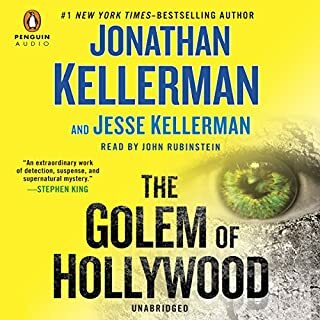 Would you consider the audio edition of The Golem of Hollywood to be better than the print version? What was one of the most memorable moments of The Golem of Hollywood? I enjoyed the alternate storyline of Cain and Abel. Have you listened to any of John Rubinstein’s other performances before? How does this one compare? Yes he is a wonderful performer. Yes but I don't want to spoil it for others! Jonathan Kellerman is one of my favorite authors and John Rubinstein a favorite narrator. I couldn't help but imagine Dr. Alex Delaware as the main character because of the narrator. He did a fabulous job otherwise. The story was very interesting to me. I love the alternate story lines and slightly supernatural feel. The ending didn't quite fulfill me and I was left with some unanswered questions and confused thoughts. All in all it was a great listen and I definitely recommend.